Why is my cat avoiding the litter tray? Fortunately for us, most kittens and cats are litter-trained when we get them because they have mimicked their mother’s behaviour. This makes life a lot easier and saves us a great deal of time. But at some point or other, your cat may show an aversion to using its litter tray and start eliminating elsewhere. Roughly 10% of all cats will develop an objection to their litter tray, which needs to be nipped in the bud as soon as possible. If it isn’t, the avoidance can quickly turn into a chronic problem that is harder to correct. Why is my cat ignoring the litter tray? There are many reasons why litter tray avoidance happens and several ways of trying to reverse the behaviour. Cats are finicky creatures that need to be sure they are toileting in an area that is clean and fresh. It may look clean to us but, to your cat, it might as well be the sewers. To keep your cat interested in using the litter tray, it is important to remove clumps daily and wash the tray thoroughly each week, replacing the litter anew. Besides issues with cleanliness, cats can be reluctant to use their trays either because it is too small or too closely positioned to eating and sleeping areas. Rather than choosing a litter tray that fits a particular corner of your home, choose one that accommodates your cat’s size. Your cat needs to have room to turn around comfortably and sit down. If your cat is avoiding the tray, move food and water bowls well away from the litter box to ensure these areas remain separate. After all, we wouldn't want to eat right beside the toilet either! In multi-cat households, cats need their own personal space to eliminate in. Their territorial nature means cats are unlikely to share a litter tray with other cats in the same household. Make sure you provide enough litter trays for every cat in your home. Sometimes it is the litter tray hood or liner that your cat doesn’t like, or it dislikes the odour of the litter. Most cats like their privacy when they go to the toilet so hooded trays are often the recommended option. That said, some cats feel too confined in this type of tray and unable to escape if they feel threatened. Odourless litter prevents cats from developing a dislike to a particular fragrance and, in turn, a negative association with using the litter tray. If your cat is eliminating outside the tray, it could be that the litter is too deep. Ideally, cat litter should be no deeper than 1-2 inches. When it is spread too thickly, cats can feel trapped and uncomfortable. Likewise, cats can be equally put-off by litter that isn’t deep enough to go about their business. It is important to be consistent in this regard. Sometimes, cats are reluctant to eliminate on certain surfaces, in certain locations or on certain types of litter. If eliminating becomes painful (for medical reasons, perhaps), cats can develop negative associations with using the litter tray. These negative feelings can stem from many other things, including having an upsetting experience in the litter tray. Household stress is another major trigger for litter problems and messy elimination. Something as simple as a new piece of furniture can be enough to upset a cat and prompt tray avoidance. 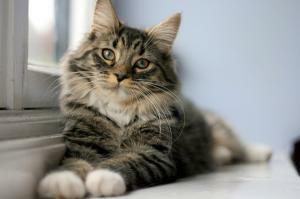 Increased household noise and activity can make a cat anxious and unsettle its routines. Try to reduce your cat’s stress levels as much as possible, using a Feliway diffuser to help. Feliway is a pheromone-based product that replicates the happy facial pheromones cats leave behind when they rub against things, usually when they're feeling relaxed and comfortable. The diffuser and spray both come highly recommended by our customers so are definitely worth a try! Opposite problem. Lazy or frightened cat comes home and uses tray when he has been out in the garden for hours! Both my 15 year old Persians began to pee all over the house , having two clean litter trays of Catsan didn't help nothing was working until I came up with the idea of confining them with their tray to give them no other option but to use it, I did this by using an extra large dog crate , with their tray and bed in it at night , after one week of being confined at night , no more peeing in the bath , on the Floors , sink . Amazing !! Best thing I ever done as I was at my whits end . They now run free in the house and no more coming in to a puddle in the hall or mess in bath..this works guys !! It's just a matter of bringing them back into close contact with tray . I urge anyone who was in my position to give it a go you won't be sorry . My problem is that my 13 to 16 year old puss, goes to the tray, might use it or just wee beside it. Often puts his front paws in and leave his rear outside. I am at my wits end. He has had so many tests etc. at the vets, nothing is wrong, but the problem still continues. If cats don't like dirty litter trays" why does mine sleep in hers ? she has got a perfectly comfy bed but sleeps in the litter tray. :( I have to keep watch and change it asap. as she will sleep on her nasty bits! (lol). Tanya's comment sounds good, but buying a large dog crate seems an expense too far when I only have one cat and hopefully wouldn't need it permanently! I have this same problem with my very old cat, Kathy.